Mayon (Philippines). Steam emissions were seen rising from the crater from 5 to 12 January when the weather allowed. Weak incandescence from the crater was occasionally seen at night. The majority of the seismic signals originated from rockfalls and detached lava fragments rolling down the flanks. Sulphur dioxide emissions fluctuated between 670 and 1,900 tonnes per day. Ground deformation measurements showed a deflationary trend compared to early December. Phivolcs lowered the Alert Level to 2 on 13 January. Nyamuragira (Democratic Republic of Congo). Washington VAAC reported a large sulphur dioxide plume in the vicinity of Nyamuragira and Nyiragongo during 10-11 January. Lava from Nyamuragira was reported to be continuing to flow S and SW on 6 January, and reached to within 7 km of the road between Goma and Sake. On 7 January ashfall was reported in Goma, 30 km S.
Piton de la Fournaise (Réunion). During 5-7 January eruptions continued from a vent along a fissure high up on the SW Dolomieu crater wall. The vent produced lava fountains and flows that pooled in the bottom of the crater. On 7 January the vent closed, but the previously erupted lava continued to flow for the next few days. On 12 January, seismicity decreased and only minor gas emissions persisted. Tungurahua (Ecuador). During 5-6 January a gas-and-ash plume rose to 6.5 km a.s.l. and drifted NW. The sulphur dioxide emission rate was 3,200 tons/day, ten times the value measured during the previous months. On 7 January seismic tremor duration and amplitude increased, and signals indicative of explosions were detected. On 6 and 7 January, incandescent blocks were ejected and fell back into the crater. During 8-10 January, cloud cover often prevented observations; on 10 January a steam-and-ash plume rose to an altitude of 6.5 km (21,300 ft) a.s.l. and drifted W. Incandescence from the crater was sometimes seen at night. Ashfall up to 5 mm thick was reported in areas W and SW on 9 and 10 January. Roaring noises and vibrating glass were occasionally noted during the reporting period. Turrialba (Costa Rica). A phreatic eruption began on 5 January following a day of increased seismicity and about 30 minutes of almost constant tremor. Two events detected about 15 minutes apart were followed by reports of ashfall as far away as 30 km. Field observations on 6 January revealed that two small vents had opened and joined together on the SE inner wall of the SW crater. Gas emission temperatures were more than 350 degrees Celsius. On 8 January seismic activity and gas emissions decreased. Observations the next day revealed that the combined vent was about 25 m wide and 80 m long. Around 60 people had evacuated from nearby farms. Barren Island (India). Darwin VAAC reported that on 11 January an ash plume from Barren Island rose to 1.5 km a.s.l. and drifted 45 km S.
Chaitén (Chile). During 16 December 2009 and 4 January 2010 steam-and-gas plumes from the lava-dome complex rose 1.5 km above the lava domes. Seismicity, along with occasional block-and-ash flows, indicated that the lava domes continued to grow. Buenos Aires VAAC reported that on 6 January a plume drifted 50 km ENE at 2.1 km a.s.l. The next day an ash plume drifted SE and E at the same altitude. Fuego (Guatemala). Washington VAAC reported that on 6 January an ash plume drifted 45 km SE. On 8, 11, and 12 January explosions produced ash plumes that rose to 4-4.7 km a.s.l. Plumes drifted as far as 10 km in multiple directions, causing ashfall in some areas. Incandescent material was ejected to heights up to 75 m. Some explosions were accompanied by rumbling noises and shock waves that rattled structures up to 7 km away. Avalanches descended the flanks. Karymsky (Russia). A thermal anomaly was detected in satellite imagery during 30-31 December 2009, 1 January and 4-7 January 2010. Seismic activity was above background levels during 1-8 January. The Level of Concern Colour Code remained at Orange. Kilauea (Hawaii, USA). During 6-12 January lava flows from the Thanksgiving Eve Breakout (TEB) and rootless shield complex were seen above the pali by observers, or detected in satellite images. Lava did not enter the ocean at Waikupanaha. Incandescence was seen almost daily coming from multiple locations in Pu’u ‘O’o crater. The vent in Halema’uma’u crater continued to produce a plume that drifted SW, N, and NE, dropping small amounts of ash, and occasionally fresh spatter, downwind. The NE-drifting plume resulted in poor air quality in some communities on 9 January. Incandescence originated from an active and sometimes sloshing lava surface within an opening on the deep floor of the vent cavity. Kliuchevskoi (Russia). During 1-8 January seismic activity was above background levels and lava continued to flow down the ESE flank. Strombolian activity periodically ejected material 500 m above the crater. A new lava flow seen on the NW flank likely began during 2-3 January. On 5 January two lava flows, on the ESE flank and NW flanks, were seen in satellite imagery. Satellite imagery also revealed a large daily thermal anomaly at the volcano. The Level of Concern Colour Code remained at Orange. Pacaya (Guatemala). On 8, 11, and 12 January white and blue fumarolic plumes from MacKenney cone rose 400 m and drifted S and SW. Multiple lava flows on the S, SW, and W flanks traveled 25-200 m. Incandescence was noted at night from one of the inter-crater cones on 8 January and from MacKenney cone on 11 and 12 January. Popocatépetl (Mexico). On 10 and 11 January emissions of steam and gas contained minor amounts of ash. Rabaul (Papua New Guinea). Activity from Tavurvur cone was at a low level during 1-10 January. No emissions from the crater were observed on most days, but white steam plumes accompanied by blue plumes were occasionally seen. On 8 January, ash emissions rose less than 200 m above the cone. Redoubt (Alaska, USA). On 5 January AVO reported that because of low levels of seismic activity from Redoubt, along with the lack of any other outward signs of progressing unrest, the Volcanic Alert Level was lowered to Normal and the Aviation Colour Code was lowered to Green. Sakura-jima (Japan). Tokyo VAAC reported that during 6-12 January multiple explosions often produced plumes that rose to 1.2-2.7 km a.s.l. and drifted SE and E. On 10 January a pilot reported that an ash plume drifted SE at 3 km a.s.l. Santa María (Guatemala). Incandescent avalanches traveled down the SW flanks of the Santiaguito lava dome complex on 8 January. 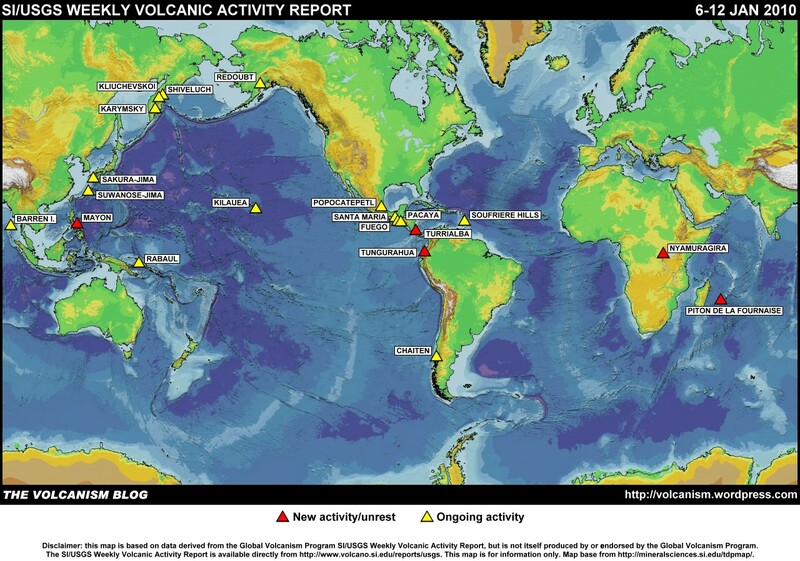 A few explosions on 11 and 12 January produced ash plumes that rose to 3.1-3.4 km a.s.l. and drifted S, SE, and SW. Avalanches from a lava flow descended the W flank of the dome. Shiveluch (Russia). During 1-8 January seismic activity was above background levels, possibly indicating ash plumes rising to 7.5 km a.s.l. Fumarolic activity was occasionally seen when the weather was clear. Analyses of satellite imagery revealed a large daily thermal anomaly from the lava dome and a gas-and-steam plume that drifted 40 km SW on 6 January. Ashfall was reported in Klyuchi (about 45 km SW) on 4 January. The Level of Concern Colour Code remained at Orange. Tokyo VAAC reported that during 6-11 January eruptions produced plumes that rose to 4.3-6.4 km a.s.l. Soufrière Hills (Montserrat). During 31 December-8 January pyroclastic flows from the lava dome continued to travel predominantly down areas to the N including Whites Ghaut (NE), Farrells plain (N), and Tyers Ghaut (NW). Observations on 2 January showed that a 40-m-high, 150-m-wide lobe of lava had been extruded northwards onto the N summit of the dome. This lobe was the main source of rockfall and pyroclastic flow activity. On 3 and 4 January ash plumes rose to 4.6 km a.s.l. and drifted NW. Ashfall occurred in areas to the NW several times during the reporting period. Suwanose-jima (Japan). Tokyo VAAC reported explosions during 6-9 and 11 January. Plumes rose to 1.8 km a.s.l. 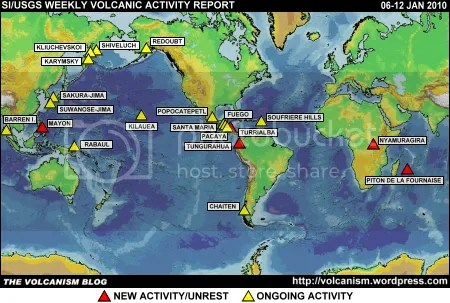 on 6 and 9 January and drifted E.
The foregoing is a summary of the Smithsonian Institution/United States Geological Survey Weekly Volcanic Activity Report covering 6-12 January 2010. It is provided for information only, and is based on but not a substitute for the full report, which comes with its own criteria and disclaimers. The map base is derived from the Smithsonian Institution/USGS/US Naval Research Laboratory This Dynamic Planet website.